Bavaria announces a new sales record at the beginning of the new exhibition season. Including the after show business, more than 160 yachts were sold at the boot Düsseldorf in January 2017. At the boot Bavaria Yachts presented not only their complete range of catamarans, sailing and motor yachts at the Bavaria World, but a new sales record was also set. During the nine days of the international water sports show and the following two weeks, more than 160 orders for new yachts were placed, thus outperforming their own sales record at the boot 2016 of 133 sold. The analysis of these figures shows that half of those are sailing yachts and the other half motor yacht sales. As in the previous year, the number of catamarans sold also increased further. Europe’s second largest shipyard presented a total of 24 catamarans, sailing and motor yachts on an area of over 4000 m² of exhibition space in hall 15 and 17. The Bavaria World in hall 17 was thus the largest single-site exhibition stand at the boot 2017 and once again underlined the leadership position of Bavaria Yachts in a very competitive market. The four premieres at the start of the show were also very successful. The new flagship Bavaria C57 of the sailing yachts' fleet celebrated her world premiere as did the motor yacht Bavaria R40 Coupe. The motor yacht Bavaria E40 FLY and the catamaran were presented for the first time at a German show. And for an impression of the future models by Bavaria Yachts, it was possible to go on a virtual tour of the new E34. Visitors could also see first design studies of the new R55, which will be presented to the public this fall. Bavaria is now looking forward to the shows in Istanbul, Miami, Fredericia and in Tulln. Friday February 3rd, the second leg of Azimut|Benetti Yachtmaster 2016/2017 came to a close. Guests attending the event, set against the splendid backdrop of Montecatini Terme, were offered three days of entertainment, professional content, workshops and team building activities. Once again the European event was the most popular, with a record number of over 200 attendees, including captains, crew members, yachting world professionals and sponsors. Earlier this month, from February 1 to 3, Montecatini Terme played host to the European edition of A|B Yachtmaster Europe, the second of the three events in A|B Yachtmaster 17, which for the last 17 years Benetti has been organising for its captains. The programme featured various training initiatives – workshops, conferences and interviews, as well as moments dedicated to exchange views with sponsoring businesses, networking opportunities and team building activities. More than 200 guests, from a remarkable 19 different Countries, met at the Grand Hotel la Pace in Montecatini Terme: captains and crew members (engineers, officers and stewardess), plus surveyors and owners’ representatives. They were joined by several selected representatives of the press, partners and sponsors. There was a packed workshop and conference schedule, with speakers offering insights on a series of current issues with practical implications. The subjects discussed included information security, the role of communication in crisis management, optimum crew management and yacht chartering from legislative and tax perspectives. The novelty at this year’s event was the day-long session dedicated exclusively to internal crew, stewards/stewardesses, organised on a joint basis with PYA (Private Yachting Association): four workshop sessions dedicated to service standards, etiquette and communication, care and maintenance services, leadership and team building. The aim of the event, the only one of its kind today, is to provide Benetti crews with consistent service standards and procedures. This need is clearly a felt one, so much so that attendees expressed the desire to extend the session at next year’s 2018 event to more than one day. There were also 3 ‘live’ interviews, an on stage comparison between three journalist and as many experienced captains (American the first, the second Lebanese and the third and last Italian), a moment that had a remarkable response. The respondents talked about their experiences as Benetti captains tackling issues linked to different countries, cultures and legal systems. Workshops and conferences were, as usual, accompanied by opportunities to socialise and have fun, as well as team building activities. Azimut|Benetti was extremely satisfied to see attendees’ loyalty continue to grow, so much so that this year Benetti decided to recognise its most loyal captains, establishing three new attendance categories: Commodore, for captains who have attended 17 events; Ambassador, for those with 13 Yachtmasters under their belt; and Champions, for captains who have attended at least 7 events. The strong efforts in Research and Development allowed Ferretti Group to defeat its competitors once again, conquering a new prestigious prize to add to its important history. The Group won the Boat Builder Awards for Business Achievement in the Innovative On Board Design Solution category, one of the eight competing areas of the prestigious event organized by Metstrade and IBI (International Boating Industry) magazine. The ceremony took place in Amsterdam last Wednesday evening, during the Marine Equipment Trade Show. The prize, sponsored by Fusion, a leading company in the production of stereo systems, speakers, subwoofers and amplifiers designed specifically for the marine use, recognized Ferretti Group for its new float-in garage and stern opening system developed in collaboration with H + B Technics. The Submersible Hatch can be found on the new Ferretti Yachts 850. It allows the stern garage door to open and tilt down onto the beach area, creating a larger beach club at water level. Once the door is over the platform, it automatically aligns and then lowers diagonally under the water together with the central part of the platform. In this way, the garage is flooded to launch the tender and jet-ski.The platform can then be submerged to various depths, allowing guests to prepare for sea activities or simply relax in the water. This successful solution not only enhances the owners’ enjoyment of their boats but presents outstanding engineering and design elements. It has been registered as a patent of the Ferretti Group and will be featured on future model, starting with the new Riva 100’Corsaro. This approach made it possible to implement several other technologically advanced and patented solutions, such as the Convertible Top on Riva 88’ Florida and 76’ Bahamas and the Dual Mode Transom (DMT) system, installed on board all the latest Custom Line maxi yacht. Fincantieri and Ferretti Group announced that they have reached a cooperation agreement with the goal of developing commercial and industrial synergies between the two Italian companies, world leaders in their respective markets. The partnership was announced during the IDEX-NAVDEX in Abu Dhabi, one of the most important global exhibitions dedicated to the defence and security sector. The agreement relates to the security and defence sector and to the recreational yachting industry. In both areas, the two companies have complementary capabilities and expertise that can lead to significant synergies. The agreement has been signed a few days ago by the CEO of Fincantieri, Giuseppe Bono and the CEO of Ferretti Group, Alberto Galassi. Fincantieri, the world’s largest shipbuilding group and number one by innovation and diversification, and Ferretti Group, one of the most globally recognized yachting companies, share a particularly interconnected market view, especially after the foundation of FSD, Ferretti Group’s division dedicated to security and defence. This is one of the factors that allowed the creation of the partnership between the two groups, strengthening its success. The top management of the two companies are committed to put the cooperation into work on specific themes and business opportunities as soon as possible. These projects will cover civil and military sectors at both national and international level. Hatteras and Cabo Yachts named Kelly Todd Grindle as the company’s new CEO, effective today. Grindle served most recently as president of outdoor products at Vista Outdoor in Overland Park, Kansas. Vista Outdoor is a $2.3 billion designer, manufacturer and marketer of consumer products in the outdoor sports and recreation markets. Former Hatteras CEO John Ward is now CEO of Everglades Boats, Hatteras spokesman Joe Cacopardo said. Everglades sales and marketing vice president Bryan Harris confirmed the move. Grindle brings to Hatteras Yachts his experience in the recreational marine manufacturing sector. Prior to Vista Outdoor, he spent 15 years as senior group vice president of marine electronics, watercraft and diving at Johnson Outdoors in Racine, Wis. During his tenure at Johnson Outdoors, Grindle was credited with restructuring and turning around the watercraft division, as well as quadrupling the size of the marine electronics group through strategic acquisitions and organic growth spurred by innovation. Held during the recent Refit International Exhibition and Conference, the Refit Excellence Awards ceremony was the site of Jarrett Bay’s most recent recognition - Best Power Yacht Refit between 50 and 100 feet. This was the second year in a row earning this honor after thorough review by an independent panel of judges. Jarrett Bay’s stand-out refit project this year was Reel Steel, an iconic 66′ Hines-Farley which received extensive updates from buggy top to props, anchor locker to underwater lighting and everything in between. Jarrett Bay Boatworks and Operation WetVet are excited to announce an opportunity offering combat veterans a day of offshore sport fishing aboard the 54' custom boat Starflite in South Florida this winter. Project: Therapy at Sea has been launched as Operation WetVet’s first program open to service connected veterans suffering from Post Traumatic Stress Disorder. The project’s mission is to gather together U.S. combat veterans suffering from PTSD to enjoy a fun day of fishing. Nordhavn introduce a new website section called Deliveries. The Deliveries section is an evolution of the old New Launch, now with more features and insight about the boat and the owners. The inaugural edition featured the delivery of Nordhavn 60 hull number 70. 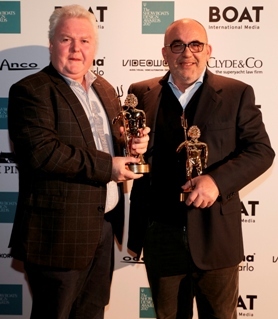 M/Y Gipsy first unit of the semi displacement aluminum Otam Custom Range has been named as “best naval architecture for semi-displacement yachts” at the ShowBoats Design Awards 2017 on Sunday the 6th of February at the award ceremony held in Kitzbühel, Austria. This 2017 SBD Awards celebrates the creative talents behind the most innovative, elegant and inspiring new yacht designs from the boards of the world’s leading yacht design studios. The 2017 edition rewarded SD 35m M/Y Gipsy with the prize for the Best Naval Architecture (semi-displacement Motor Yachts category) which is intended to recognize naval architects whose design for a qualifying motor yacht combines efficient hydrodynamics with elegance in a hull that properly meets its intended purpose, particularly in respect of performance, seaworthiness, range and economy. The real “mantra” for Otam Yachts that built his production and reputation - of over 63 years of history - on yachts with exceptional seaworthiness, efficiency and powerboating based performances. The yard receives this award with immense pride as a recognition not just for the yacht itself, but for the great passion and efforts made since the beginning of 1954. Princess is delighted to announce a collaboration with Williams Jet Tenders to produce a 'Princess Edition' jet tender. Available across the Turbojet range, the distinctive colour scheme has been designed to compliment Princess Yachts' models and provide customers with a uniquely styled craft. The stylish Princess Williams Jet Tenders are made to order and available from Williams directly through Princess Distributors. Williams are recognized as the world leaders in the manufacture of jet tenders and have been offering tender solutions to Princess clients for over a decade. The 'Princess Edition' tender encapsulates this relationship in an exciting and eye catching way. Each tender is finished with a custom metallic grey helm, unique inflation tube design featuring the Princess forward line branding with a two tone look, and the Princess crown embroidered to the upholstery. Additionally an identification plaque marks the tender as a limited edition model. One of the cornerstones of our partnership is sharing expertise and knowledge. Eddystone Reefs is a critical example of this in action, just offshore from Princess's home in Plymouth. It involves what has been described by a leading commentator as "the single most effective activity the Marine Conservation Society has ever undertaken in its entire history". In 2012, using the latest academic research, MCS challenged the legislation which was intended to protect wildlife and habitats as it didn't regulate fishing activity. This left supposedly 'protected' sites open to harmful fishing operations. Acting together with environmental lawyers Client Earth, MCS won their challenge, meaning for the first time these sites, which cover 23% of English inshore waters, are actively protected against harmful fishing operations. One newly protected site is Eddystone Reefs area, and thanks to a commitment from Princess Yachts, MCS has a much needed injection of funding to complete the research and prove that protecting our seas has a positive impact on biodiversity. Since the local regulators stopped trawling and dredging following MCS' legal challenge, MCS Seasearch divers have been surveying the shallow rocks of the reef and further down to 45 meters. To monitor the really deep areas, around 50m, MCS needs to continue to survey using remote camera equipment, then analyze the data and publish findings to make the case for such important protection measures. It's vital that this work continues so we can finish the story we started in 2012 and share the outcome on an international stage to inspire others to act. Aaron Crawford has been promoted to President, in addition to retaining his responsibilities as Chief Operations Officer. Aaron brings more than twenty years of manufacturing, design, and engineering experience to his new role, the last seven of which have been with Sabre Yachts. Aaron is an experienced boater and lives on the coast of Maine with his wife and two daughters. Glenn Campbell has taken over as Head of Engineering at Sabre. Glenn has been an integral member of our engineering team since 1997 and has contributed to more than fifteen new models in that time. Glenn received a BS in Industrial Technology from the University of Southern Maine and initially joined the Sabre engineering team as an intern while he was completing his degree. On tenth February 2017 Sanlorenzo was extremely pleased to celebrate the reaching of fifty thousand fans on Sanlorenzo Yacht’s official Facebook Page. A great achievement for the Liguria Italy builder who offer a semi-custom and custom range from 78 up to 210 feet. Sea Ray was recognized by the marine industry’s independent trade organization for excellence in customer satisfaction, marking the 13th consecutive year the company received the honor. Sea Ray earned three 2016 Customer Satisfaction Index (CSI) Awards from the National Marine Manufacturers Association (NMMA), bringing the company’s total to an outstanding 67 CSI Awards. The NMMA formally announced the awards during the Industry Breakfast held at the 2017 Miami International Boat Show on Friday, February 17. Sea Ray’s newest awards came in the following categories: Deck Boats, Fiberglass Outboard Boats, and Sterndrive Bowrider Boats. The CSI Awards are an independently administered measure of customer satisfaction, only recognizing boat and engine manufacturers that receive the highest marks. The Marine Industry CSI Awards program honors participating manufacturers that actively measure customer satisfaction and pursue continuous improvement to better serve the customer. For this calendar year, award recipients achieved and maintained an independently-measured standard of excellence of 90 percent or higher in customer satisfaction with at least 25 completed surveys or 15 completed surveys and a 50% response rate in a category/segment over the past 12 months, based on information provided by customers purchasing a new boat or engine during the period between January 1, 2016 and December 31, 2016. The Wider 150 has been awarded two more prizes at the ShowBoats Design Awards held in Kitzbühel on Sunday 5th February. This brings the total number of awards for this exciting new yacht to eight, a remarkable achievement for a yard delivering their first superyacht. These latest awards were in the categories for “Best Exterior Design and Styling Motor Yacht below 48m” and “Most Innovative Motor Yacht”. The event attended by more than 300 of superyacht’s senior figures, including most of the leading designers and heads of shipyards around the globe honors the most creative, innovative and inspiring sailing and motor yachts delivered in the last year. Amongst the many noteworthy features that were highlighted by the judging panel, the wings on the upper deck of the Wider 150, allowing for full walk around whilst allowing a full beam sky lounge, put the Wider ahead of the other finalists in the “Best Exterior Design and Styling” category. Within the “Most Innovative motor yacht” category, the judges considered the Wider 150 a clear winner and a real ‘shape-shifter’, declaring that “the corollary to the adage ‘form follows function’ is that when function changes, so must the form, and that is what Wider CEO Tilli Antonelli has arranged throughout the yacht, allowing it to live bigger than its actual LOA.”. The true innovation of the Wider 150 is her diesel electric propulsion system which allows her to offer a completely new layout below deck. This frees up space to be used at the midships which can be given to the owner allowing this 47m yacht to include a 90m2 beach club with 7m swimming pool which doubles as a garage for a 32’ tender, unique in this size range. Adorning a superyacht with suitable accessories is no small task. Wider are delighted to partner with Boutsen Design Yachting to ensure that the job is carried out to the highest possible standard of excellence. With extensive experience in the arena of private aircraft and luxury homes, Boutsen Design opened their Yachting division in Monaco in January 2016, with Executive Vice President Maxime Castellini-Ninio at the helm. Maxime has an impressive CV which includes being responsible for the outfitting of the new Monaco yacht club which opened in June 2014. Boutsen Design Yachting offer a comprehensive selection of luxury items and shall continue to work with Wider to create bespoke interiors that are the perfect finishing touch to enhance the yacht's experience onboard. The Viking VIP saw enthusiastic crowds topping over 1,000 people during the two-day run of the block buster show. Held at the Viking Yacht Service Center in Riviera Beach, Florida, the most beautiful fleet in the world was on full display and for the first time showcased the new Viking 37 Billfish. A parade of admirers kept the 37 busy and rave reviews came flooding in. The boats were put through their paces and 85 sea trials were completed on a pair of picture perfect days. On the other side of the docks, 50 of Viking's valued vendors set up shop and spent one-on-one time discussing and demonstrating products such as fishing tackle and gear, décor, electronics, towers, power options, insurance and many other amenities related to the Viking product line. If you missed the VIP Boat Show, make plans to visit us at Yachts Miami Beach on Collins Avenue next week beginning on Thursday, February 16, and concluding on Monday, February 20, 2017.